May I speak in the name of God who is Father, Son and Holy Spirit. 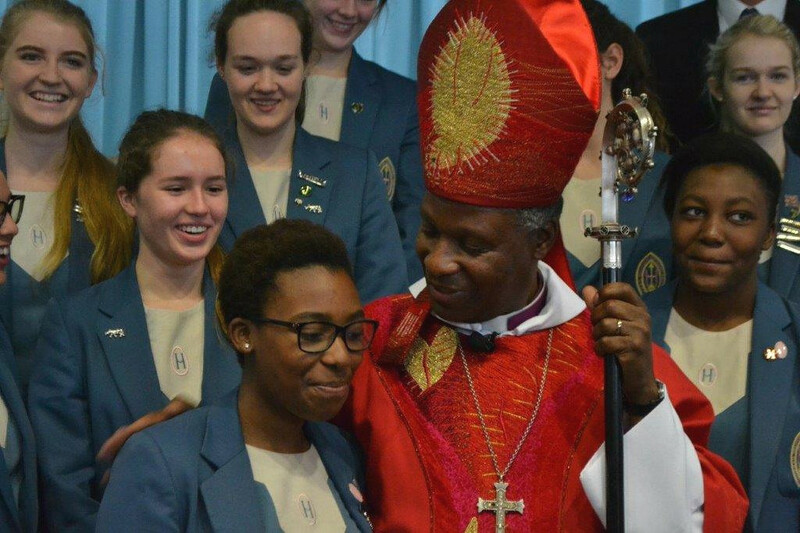 Archbishop Thabo had the "rare and humbling opportunity" to confirm Paballo Makgoba and her friends. Our warm thanks to you, the heads of the participating schools – Mr Stewart West of Herschel Girls, Mrs Sue Redelinghuis of St Cyprian’s and Mr Guy Pearson of Diocesan College (Bishops); to your chaplains – the Revd Sue Taylor, the Revd Natalie Simons-Arendse and the Revd Terry Wilke; to Archdeacon Keith de Vos and clergy from Bishopscourt; to the parents and godparents of those to be confirmed today, for all that all of you have done to nurture them, to prepare them for today and for organising this service. This is indeed a special confirmation, almost like an ordination in a small diocese. It is also personal for me, in that I am confirming our daughter, Paballo, which is a special privilege. Thanks to Herschel Girls School for hosting us and for the preparatory work you have done, and thank you to all of you – the candidates – for visiting Bishopscourt yesterday. I hope I am not breaking your confidence, but the questions you raised at our session together were profound. For example, is it necessary to go to church every Sunday; is it sinful to self-harm or commit suicide; and on the subject of COP21, the United Nations Climate Change Conference in Paris in December, is it only Christian leaders or do other leaders attend? Thank you also for signing the COP statement and petition. A little further on from the reading that we heard today from John's Gospel, John 6:56-69, Jesus says that he is "the way, and the truth, and the life". And Christians have sometimes been described as people of "the way". So what does it mean to say that he is "the way", and what does it mean to be people of this way? Recently, while I was taking a walk in these parts, I came across a man, probably in his 50s, who was carrying a couple of pieces of dry brown bread and methodically moving from one rubbish bin to another as I watched, opening each in turn looking for food, but with no luck. At Cavendish Square, as I neared him, he sighed desperately, and I gave him money for bread -- at which he beamed, overjoyed and grateful. Now I know all the arguments against handouts, but let's just step back a bit. Shouldn't it disturb us deeply that just down the road, outside what must be one of South Africa's most wealthiest shopping malls, we should have people scavenging for bread? That while those living between this school and the cliffs of Table Mountain – including me at Bishopscourt – stay in huge houses on large properties, a third or a half of our people (depending on whose statistics we use) live below the poverty line. Inequality in our society is real. Desperate poverty and extreme wealth in the same city is real, and drives a wedge between us. The dumping of food by some in the midst of scrounging from bins by others is real. "Almost without being aware of it," says Pope Francis, "we end up being incapable of feeling compassion at the outcry of the poor... The culture of prosperity deadens us..."
People of the way, people who at baptism are united with Christ, who are called to denounce evil of all sorts, are also called to come alongside the hungry, to share, and not to dump our food in rubbish bins. As Pope Francis also urged us, those empowered by the gift of Jesus the Holy Spirit, who gives us courage to overcome the divide between us, are called first to intercede and then to go and do something about the poor. I am at present talking to a number of people, most of them business leaders, who provided me with a brief this week in which they say that "unemployment has to be South Africa’s national emergency." They say unemployment is at 12-year high and, logically, point out that the direct consequences are poverty and inequality. Those of you who know me will be aware that I have a particular passion about not just inequality, but especially the inequality of opportunity in our society. Because at the end of the day, once we have dealt with people's most desperate needs, the best we can do for them is give them the opportunity to lift themselves out of poverty. And so the best way to create equal opportunity is to provide everyone with a decent education. Yet in South Africa we are not giving our children the quality of education they deserve; in fact we don't even give them an education commensurate with the amount of money the State puts into the sector. Of course the schools represented here are an exception, and I am pleased to say that you are doing well in your outreach to others who are not as privileged as you. to establish high quality accessible Christian schools. You can help us in all three of these areas. While we are proud of your schools, the Church believes it crucial that we also establish high-quality schools which are more easily accessible to low-income South Africans. Next year we are opening an Archbishop's boys’ school in Sophiatown in Johannesburg, and in Lesotho we will be building the Maboee Archbishop High School. Please pray for our efforts and give towards them. In our church calendar in Southern Africa, today is also Theological Education Sunday. In our church, we are giving high priority to theological education as well as to education in general, because without well-trained theological minds our clergy will struggle to minister in our rapidly-changing world. For it is a world in which most people are not finding the meaning and happiness they desperately want. It is also a world people are struggling to balance the pursuit of personal benefit with the pursuit of the common good of all. Today, as each of you confirmation candidates, make a commitment in faith in the presence of all of us, you too are preparing to enter a world in which nothing seems constant or stable, in which individual interests and the common good are at loggerheads. But you can be assured that God will sustain you in grace, love and salvation, as promised by scripture, as you engage in prayerful reflection and reason in charting the way ahead. In communities of faith, you will be nourished by the sacraments, celebrated in transformative liturgy and worship – and don't let me hear that church is boring, for you are the church and transforming it is your responsibility, whether it is in styles of worship that make it meaningful to your generation or in making it more relevant to the needs of that beggar I met who looks for food in bins while others throw it away. Paul, in the second letter to the Ephesians read today, urges us to be bold and courageous in proclaiming the truth. I hope in your confirmed life, you will do as St Paul urges. 7. Watch less, do more. may today inform, transform and form each of you, empowering you to speak that truth which unsettles and brings life to the self-assured and the dead in spirit. Amen. Inspirational indeed.. Thank you Archbishop, May the good Lord continue to bless and use you. Amen.